Previously on this blog, it was stated that starches and cereal grains were good food for cows and horses, but not man. Man is instead better off eating food that is readily, easily, and perfectly digested. Cases in point: fruit and fruit juices. I will put forth herein why this is the case, and expand on some of the perils of excess starch consumption discussed in the last post. A prominent feature of consuming starches concerns the previously discussed phenomenon called persorption (aka translocation). Briefly, persorption describes the absorption of non-soluble microparticles through the intestinal lining and thereafter into the lymph vessels, mesenteric veins, and then distributed to tissues throughout the body. Nonetheless, there is still a lot we do know. For one, we know that starch granules can appear, really, anywhere in the body, including the urine, cerebrospinal fluid, peritoneal fluid, fetal blood, umbilical cord, and milk of lactating mothers. Two, we know that the indigestible parts of plants are the main sources of particles for persorption processes, namely starch granules, and the smaller they are – like the granules found in corn, wheat, and oats – the more likely they are to undergo persorption processes. Three, we know that stress, physical injury, toxins, and inflammation can increase the persorption rate considerably by disrupting the tight junctions between enterocytes, which normally keep persorption processes in check. Four, we know – because it’s been confirmed by way of electron microscopy – that starch granules appear in the blood on oral consumption of a variety of starchy foods without a doubt. 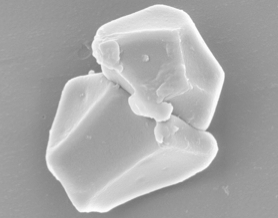 And, electron microscopy has confirmed what researchers decades before meticulously counted out – that starch granules are found on the order of 10-100 granules per 100 milliliters of blood, depending on the starch source, inherent variations among people, drug use, etc. And five, we know that these microparticles are detected in the body as soon as 2 minutes after consuming them, reaching peak concentrations at around 12 hours, before being completely eliminated from the body by 24. An area of research that is worthy of further investigation is the fate and bodily effects of these microparticles once they are persorbed into the body. Though, it’s at least known that larger granules clog arterioles, and that the consumption of the aforementioned starches are provisionally linked to autoimmune diabetes (Mueller et al., 2009) and senile dementia (Freedman, 1991). 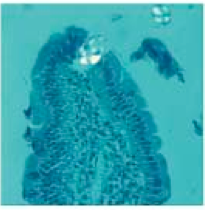 Persorption of potato-derived granules (white) through the tight junctions of intestinal villa. The chronic ingestion of starches could, sooner or later, cause uncontrolled fermentative activity in the intestines with an attendant production of gases, acids, and alcohol (Hamer, De Preter, Windey, & Verbeke, 2012). These byproducts of microbial fermentation end up causing intestinal irritation and inflammation that in turn, compromise our ability to absorb nutrients properly – predisposing to more fermentative activity. Then due to insufficient nutrient assimilation, the enteric nervous system weakens and this leads to an impairment of digestion, again, compromising our ability to defend against fermentative processes even further. Easily digested foods are ideal and should form the lion’s share of our diets. As compared to starches, fruit is highly digestible – some fruit more than others – and are thus much less liable to ferment. Another feature of consuming starches is the rise in lipopolysaccharide after meals. If lipopolysaccharide levels increase 2- to 3-fold above normal, metabolic endotoxemia manifests, where pathological processes – mediated by macrophages – first produce inflammation and insulin resistance in the liver, and thereafter, in the adipose tissue and muscles. LPS and the damages therefrom are easily amenable to experimental procedures. Diabetes and obesity are associated with high rates of LPS absorption (Brun et al., 2007), but laxatives or antibiotics against gram-negative bacteria – by changing the microbial landscape – eradicate LPS and the resultant metabolic derangements (e.g., Ley et al., 2005; Pappo, Becovier, Berry, & Freund, 1991). The mechanism by which LPS is absorbed at the surface of the intestinal lining is different from persorption in that LPS is absorbed by way of newly formed chylomicrons in the enterocytes, wherefrom they – via chylomicron remnants – are taken up by the liver. This is why diets high in fats – that is, long chain fats – consistently increase LPS concentrations in the body (and why short chain fats don’t) and why the damages incurred from LPS first manifest in the liver (Ghoshal, Witta, Zhong, De Villiers, & Eckhardt, 2009). I think the importance of LPS and bacterial fermentative processes is clearly illustrated by an experiment wherein mice reared without germs had about 60 percent less body fat than normal mice, even though the germ-free mice and normal mice ate the same amount of food (and lost equal amounts of fat in their feces and absorbed an equal amount of fat) on switching to a so-called Western diet, which was high in fat and sugar (41 percent of calories of each) for 8 weeks. 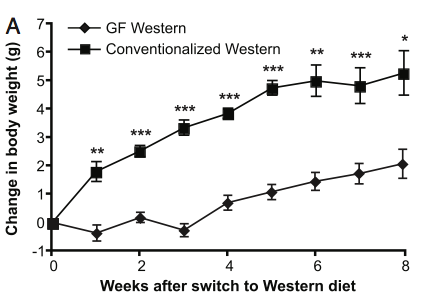 The resistance to fattening in the germ-free mice was accounted for by an increase in their triglycerides and their energy expenditures. Metabolic endotoxemia also promotes – in a vicious cycle – the release of fatty acids, and these fatty acids (i.e., NEFA) in turn, stimulate their own uptake and oxidation, and thereafter, inhibit the use of glucose, thereby initiating the stress metabolism. . . . Nonetheless, fructose – of which starch contains none of – is supportive in that it raises energy expenditure and carbohydrate oxidation more than glucose does, about 1.5-fold more, and at the same time, stimulates insulin secretion about 4-fold less. Thus the increase in energy expenditure by fructose is not caused by insulin alone. But rather, other thermogenic mechanisms are involved as well, as evidenced, for instance, by a 40 percent blunted increase in energy expenditure when fructose was given with a β-blocker (Tappy et al., 1986). Furthermore, because a high rate of glucose oxidation is required for fructose-induced thermogenesis to kick in, fructose permits (and could restore) glucose use (Ravussin, Acheson, Vernet, Danforth, & Jequier, 1984). Taken together, although obesity and diabetes are associated with lower-than-normal rates of carbohydrate oxidation, diet-induced thermogenesis, and excessive fat oxidation already, fructose can, to some extent, normalize the derangements associated with metabolic endotoxemia – without the need for pharmacological doses of insulin. Fructose (and sucrose) is additionally supportive in that it – more efficiently than glucose – stimulates the deiodination of thyroid hormone to its active form, T3. Thus cells throughout the body see a greater exposure to T3, permitting the long-term effects of T3, such as the upregulation of enzymes that control basal thermogenesis (e.g., UCP) and energy production (e.g., cytochrome c oxidase). In summary, a cereal grain- and starch-based diet could lead to degenerative changes in the bowels that are self-reinforcing, whereby damages sustained in the digestive tract predispose to further fermentative processes – precisely what initiated the damages in the first place. Consequences include metabolic endotoxemia and persorption with an attendant slowing of the metabolic rate, loss in energetic efficiency, and a switch to predominantly fat oxidation. Fructose, however, through various mechanisms – like insulin – can help to soften these metabolic derangements. Eradicating foods that are resistant to digestion in the upper intestines curtails fermentative activity in the lower intestines and thus, prevents damages that permit substances like starch granules to pass through at a high rate. 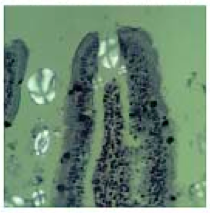 The production of LPS is blunted, too, simply by virtue of keeping bacterial proliferation in the intestines in check. Consequently, the long-term sequelae seen in the digestive tract in investigations made during the 19th century can be, at the very least, delayed. Some degree of bacterial fermentation is physiological and could even be beneficial. However, as evidenced in the germ-free rodents, it is not absolutely essential for life – albeit in artificial settings. Nonetheless, even fully digestible foods provide fodder, in small amounts, to keep intestinal bacteria adequately fed so to speak. Ravussin, E., Acheson, K., Vernet, O., Danforth, E., & Jequier, E. (1984). Absence of a thermogenic defect in response to glucose/ insuin infusions in human obesity. Diabetologia, 27(324A).